From our previous tutorials you could have learned how to get a basic ASP.NET MVC event calendar and a simple ASP.NET scheduling solution for your application. In this tutorial we decided to show how you can extend the functionality of our web-control to create an online room booking calendar or other reservation service. For your convenience, we have provided the tutorial with code snippets, screenshots and detailed descriptions. You can also check this online demo. Sign up and get the final package. To begin with, download the latest update of DHTMLX Scheduler .NET. The initial steps (1-4) to create project and a database are set in the documentation. As far as it's going to be an online booking service, let's name it RoomBookingCalendar. First of all, you have to build up a user infrastructure. We decided to use a built-in ASP.NET Membership. Here we have added two new columns: room_id (ID of the room) and user_id (ID of the user) to link users and rooms with calendar events; the text column contains text data type in this case. 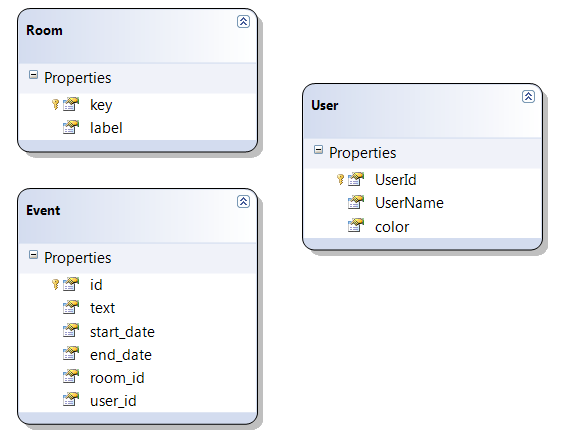 Note that a primary key and an identity column should be enabled for [key] and id. 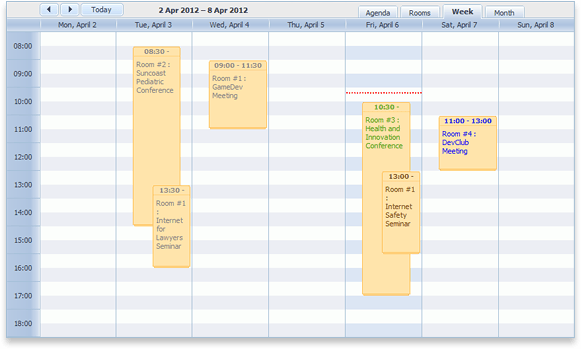 Once you've added all tables to your booking calendar project, you can set up models. Right-click on the folder Model -> Add New Item. Select LINQ to SQL Classes and create a new data model (e.g. MyEvents.dbml). Now you can get down to the creation of models. The models are created for only three tables: Rooms, Events and aspnet_Users, which you drag from the Server Explorer to the designer area. The aspnet_Users model should have only "UserId", "UserName" and color properties, the rest should be removed. Rename this model into "User". Remember to change the redirect path from "Home" to "Booking" in the AccountController.cs. // The required client-side handlers have to be added after Scheduler initialization but before events load. Note that context is MyEventsDataContext throughout the code. // User ID is assigned to his newly added events. Specify the property to be used for this purpose. Now bind a model to render it in view. Information about rooms and events' colors is used in the client-side API. It should be rendered to the client side. We have added three users with the following names/passwords: guest1/ guest1, guest2/ guest2 and guest3/ guest3 to log in this room booking calendar. Colors for users and the required number of rooms are set in the database. New users for the booking calendar are created by using the Web Site Administration Tool that you can access via ASP.NET configurations. You can also set additional styles to your online booking calendar. For example, change the calendar background or the authorization field. After completing all the above steps, you get a ready online booking calendar service with a user login form and Agenda, Rooms, Week and Month views. View online demo. Save up your time! Sign up and get the final package.